The state-of-the-art amenities include the award-winning AlmyraSpa, four outdoor pools, including a children's pool, an indoor Spa pool, tennis courts, table tennis and four restaurants. 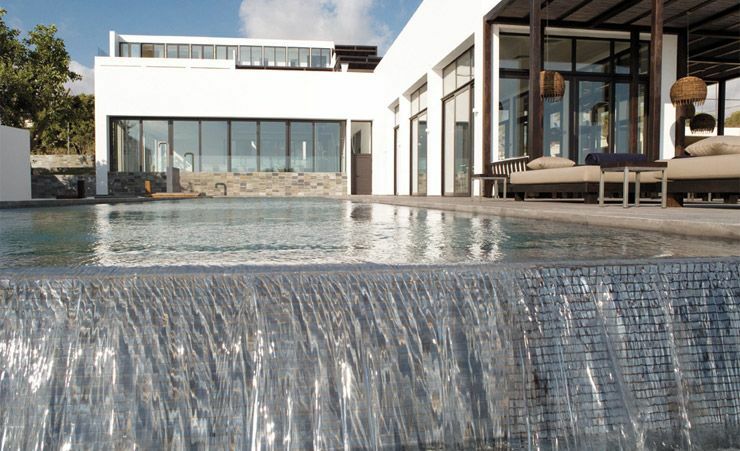 Almyra hotel is within walking distance of Paphos' many restaurants, cafes and boutiques, including the House of Dionysos, a UNESCO World Heritage site, with four golf courses just a short drive away. Guests can also take advantage of the extensive range of facilities at the hotel's adjacent sister resort, Annabelle. Almyra's rooms are luxurious with a contemporary design. 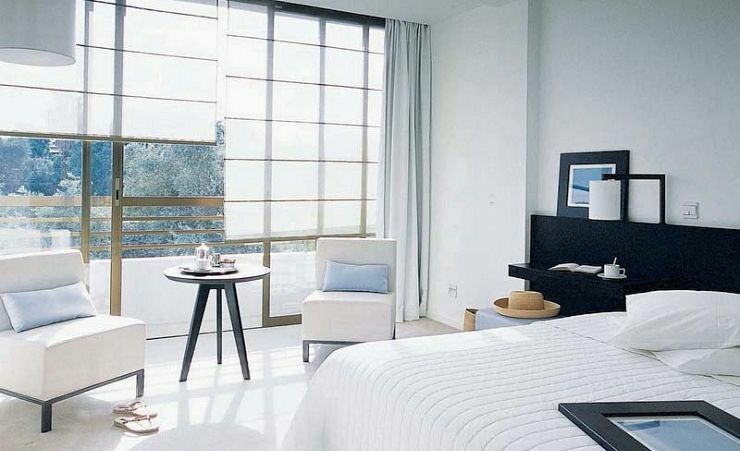 Floor-to-ceiling windows offer fabulous views of the landscaped gardens and Paphos town in the distance. All rooms are en suite and feature flat screen satellite TV, radio, minibar, hairdryer, bathrobes and complimentary Wi-Fi internet access. Seaview rooms are available at a supplement. Rooms come with air conditioning depending on the season. 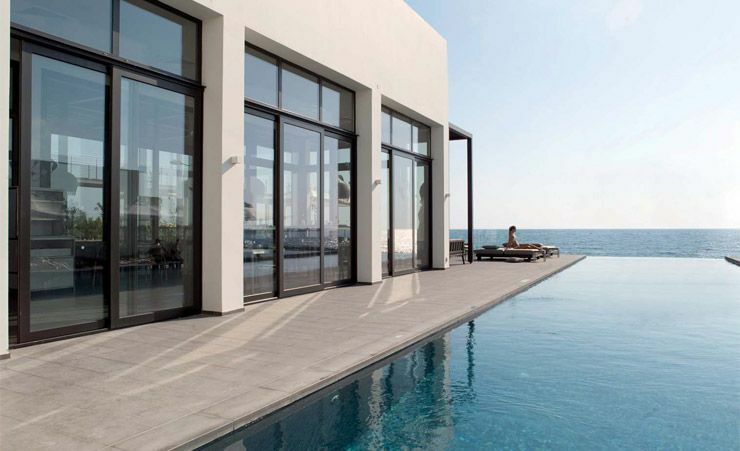 Almyra's custom-designed furnishings and sleek interiors have earned the hotel the title of Cyprus' first Design Hotel, an award which recognises independent and visionary hotels. 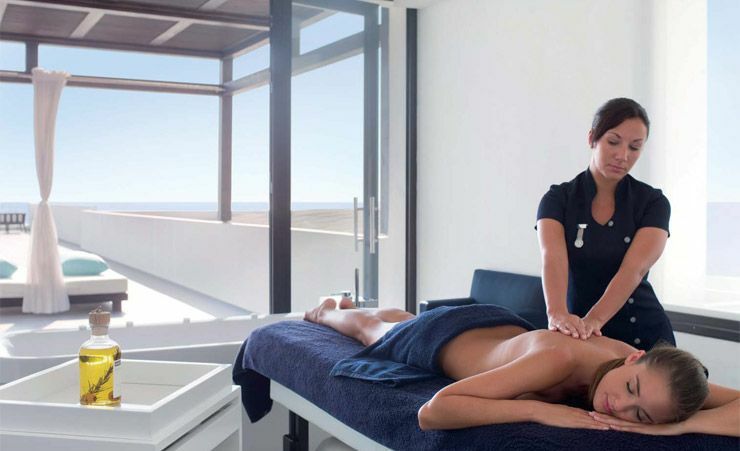 The hotel is contemporary, whilst remaining comfortable and convenient, providing guests with a luxury holiday experience in the heart of Cyprus. 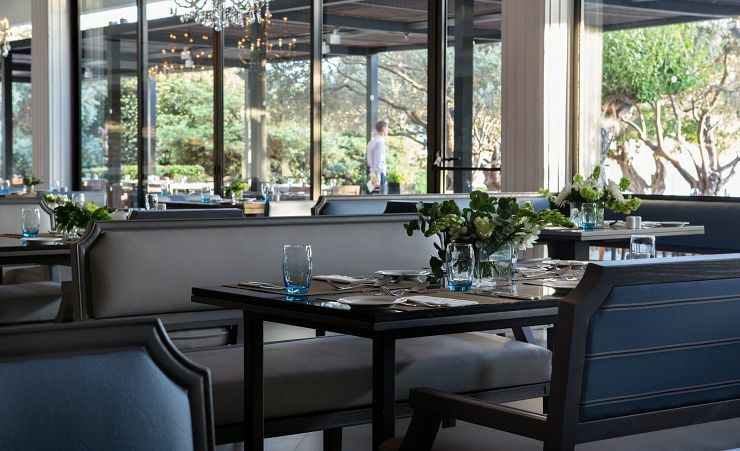 Guests Half Board and Full Board will take their meals at the Mosaics main buffet restaurant. Additional restaurants are at a charge. Whilst shared transfers are included in the price of your holiday, you can upgrade to private transfers from just £21pp when flying into Paphos Airport or £96pp when flying into Larnaca Airport. # One adult only and one children's pool. * At a fee, watersports are under separate management. Find out more about your accommodation and the in room facilities at the Almyra . There’s nothing ‘ordinary’ about anything at Almyra: even our entry-level rooms have sleek white décor, cutting-edge artisan furniture, marble bathroom and their trademark easy-breezy vibe. 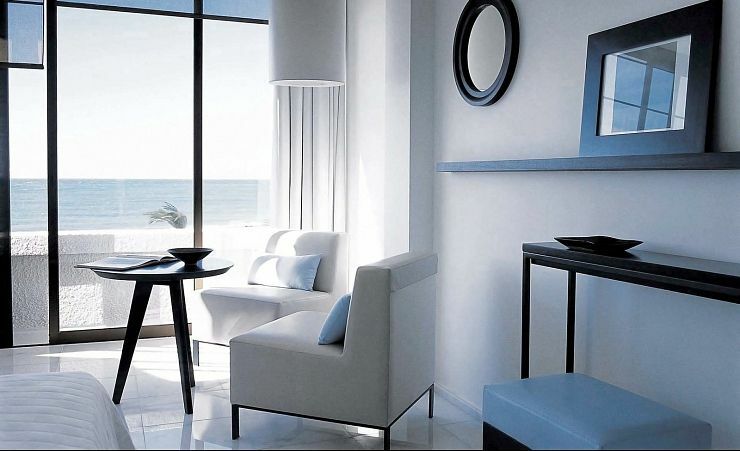 A stylish main-building escape, furnished with sleek décor, cool marble and handmade artisan furniture. Sweeping sea and castle views through floor-to-ceiling windows add an atmospheric backdrop to the chilled-chic design. Vey good hotel, staff excellent, location very good, walk via coast flat path into Paphos, nd alongside the sea. Very pleased with our stay. A little light entertainment in the evenings would be welcome, especially during the winter season. Lovely hotel, beautiful room (We were upgraded to a suite) Roomy and comfortable dining room with excellent staff and personal service. Good food, well presented. Highly recommended to other people. Staff are wonderful- helpful & friendly. Love the hotel the outdoor areas and spa. Lovely hotel in a great position. A good range of food for every taste. The staff throughout the hotel were top class, friendly helpful and very efficient. Would definitely stop here again. The staff were excellent, helpful, cheerful and smartly dressed. I hope to holiday at the Almyra Hotel again next year. Very nice hotel with attentive and friendly staff. Very close to local facilities. Hotel room very clean and spacious, very comfortable bed. Food has improved since last visit. Brilliant hotel, good position, very friendly and helpful staff, delicious tasty food and very polite helpful dining room staff. Good position. Comfortable bed and nice size room. The hotel made our Ruby anniversary and my husbands birthday very special. Excellent friendly staff and beautiful clean rooms and grounds. Good selection of food. A lovely friendly hotel. Well run by enthusiastic staff,all of whom made our stay memorable. We have now been 3 times. A Very friendly, helpful, comfortable and clean hotel. Thank you for providing such an excellent holiday, really enjoyed. Wonderful, we will return. Your staff are great. Hotel was so clean. See you next year, if not before. Great hotel in great location. Food excellent and the staff exceptional. This was a truly outstanding holiday from the first phone call to the end of the holiday. We would love to return to the Almyra. A lovely hotel with excellent food and service. We would go back tomorrow if we had the time hopefully we can go back the same time next year at the Almyra Hotel. .lt was the perfect holiday for my husbands birthday nothing was to much trouble for the staff. Exceptional service. wide choice of excellent food. We have travelled a lot of places this hotel the Almyra is the best yet. staff very welcoming and friendly always keen to be helpful. 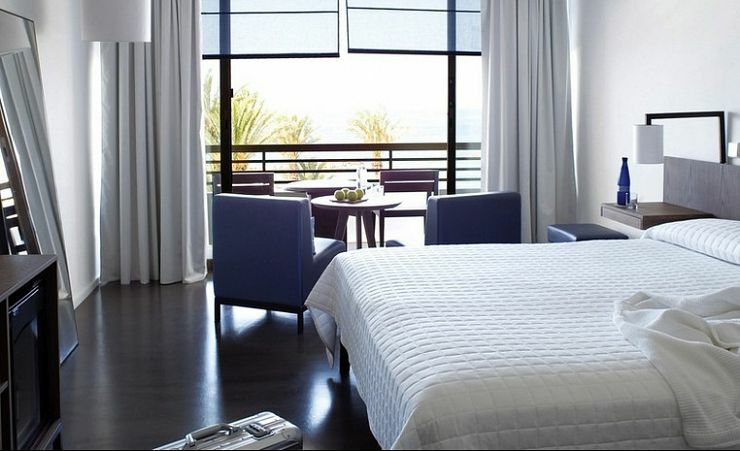 The Almyra is always my first choice hotel in Paphos. The staff are so friendly and helpful, the food is amazing. You cannot fault this holiday and we look forward to visiting again. Staff very friendly and pleasant. Overall a very pleasant trip from start to finish. We were also at the Almyra in March. Then as now, everything about the place was perfect. The food outstanding and the staff were friendly attentive and efficient. Our room 215 was spacious, nice balcony looking towards the sea, lovely bathroom with walk-in shower and very clean. Excellent as usual. Staff very friendly and helpful. Another great holiday at the Almyra. Once again we had a thoroughly enjoyable holiday. This was our fourth visit to a lovely hotel. We brought friends with us this time and they also enjoyed it. We will all be returning next year. The food especially was excellent and the upgraded suite you gave us was the "icing on the cake". The Almyra is a very stylish hotel, we had a wonderful sea view from our room and very much enjoyed our stay there. The staff are friendly and efficient and the food is very good. Any requests were dealt with very quickly and staff very helpful. This hotel provides guests with a very relaxing, good quality holiday experience. The facilities and the friendliness of the staff are excellent. Very friendly staff and excellent location. Staff in every department were excellent,eager to help in any way, upgraded on arrival to wonderful rooms, great start to great holiday. As always for me EVERYTHING was great. When I had to seek medical attention everyone was most helpful. and helpfulness. Food.. varied and of excellent quality. Hotel staff were helpful and friendly from arrival to leaving. Food and accommodation were excellent. We would definitely stay at the Almyra again. Excellent hotel could not fault it. Good location first class accommodation and food. We stopped here for 3 weeks, we found the hotel to be in an excellent position overlooking the sea, with most shops and restaurants open and very nice walks along the sea front both left and right of the hotel also with easy walking distance to the harbour. The food was very nice, always changing and freshly made. Everyone who we can into contact with was very polite, friendly and courteous. Staff outstanding and extremely polite and helpful. Superb hotel, all staff wonderful,it’s like home from home. Great hotel all round. Good location, friendly and helpful staff. Food is good quality and plentiful. Rooms are spacious and kept spotlessly clean. Very good service at Almyra. The almyra is a wonderful hotel and the staff are so lovely and friendly everything about it is brilliant such a relaxing holiday can't wait to return. Almyra hotel is by far the best hotel we have stayed in when booking with Mercury Holidays and would highly recommend it to relations and friends. Ideally situated in the centre of Paphos, set in larger than normal gardens with numerous facilities. All the staff were very friendly, helpful and proficient. The meals were outstanding so much choice all freshly prepared, the restaurant was large so never felt too crowded. We intend to return in the future. The only disappointment was the brochure said a dress code applied, but it was not enforced. Brilliant hotel fabulous staff all so kind and helpful. Wonderful superior sea view room spotless and very clean. Superb views best sunsets. What more can I say. Will be going back very soon. Highly recommend the whole experience. Clean, comfortable and friendly hotel. First class facilities and location. Hotel is situated and designed most beautifully. It is a pleasure being there. I have stayed at this hotel several times and have always been satisfied in every respect. 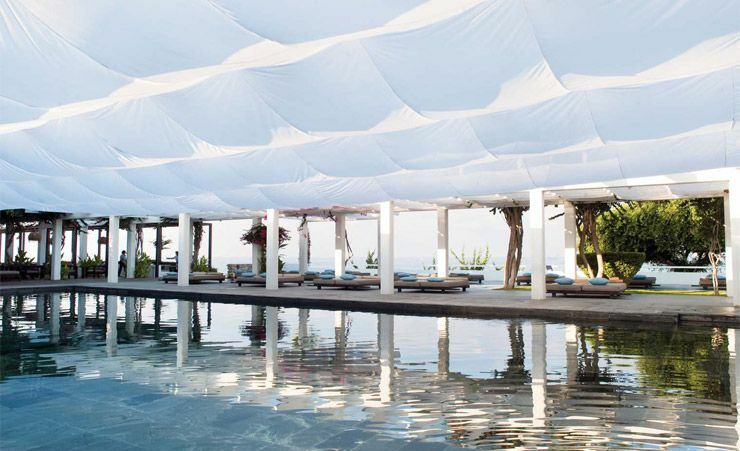 The Almyra is a beautiful, tranquil hotel. Reception staff totally amazing, as is the restaurant team. The only issue we had with an inland room was the lack of a walk-in shower - this was rectified after a few days. Excellent hotel as in previous years. Staff are very friendly and helpful. Staff brilliant especially Eleni in mosaic restaurant. Excellent value for money including room upgrades etc. Needless to stay we do hope to return to really enjoy the hotel at a later date when my husband is fully back to health. Fiona also showed concern and booked suitable plane seats for our return journey. A wonderful hotel. The staff were fantastic, nothing was too much trouble. The outdoor areas were spotless. The hotel really exceed all expectations. Breakfast and dinner were delicious with huge choices daily. I can't wait to go back! The best hotel we have ever stayed in. Excellent hotel, Excellent staff, It all made for a great holiday. It,s just a stones throw from the centre of Paphos and its night life. Requests dealt with quickly eg tea making. bath entry assistance handle. extra key all dealt with in half an hour. A little spartan in appearance for a five star, but overall very nice indeed. The staff in the hotel were outstanding - helpful, courteous and friendly. If we were to go back to Paphos would certainly return to the Almyra. The staff treated you as if you were royalty and nothing was any trouble. Loved the hotel & the staff & service was excellent. This was a v efficient hotel,and we had no complaints. Hotel was super and the staff so helpful.We had a lovely room and fortunately wasn't affected by the building work. The food was varied and to our taste. The best thing about this hotel was the wonderful staff. Very attentive and caring. Fabulous. It was a return visit and we were not disappointed. The only area that could be improved is the attentiveness of the staff in the spa. They didn't check the sauna area on a regular basis and if someone had slipped it could have been hours before they were found. Otherwise all great. Wonderful staff,good choice of food,comfortable room,we'll run dining room,but found it not well lit,gloomy ,n fact,commented before departure.Had several meals at the Annabelle because the dining room was brighter. We stayed in two fabulous hotels. The Almyra is very classy and clean lined, with excellent food and service and wonderful facilities (internal and external pools and gym and spa areas). We moved to the next door Annabelle for the last two nights, because of works in the Almyra. The staff of the Anabelle were very attentive and friendly and the choice of food was excellent. 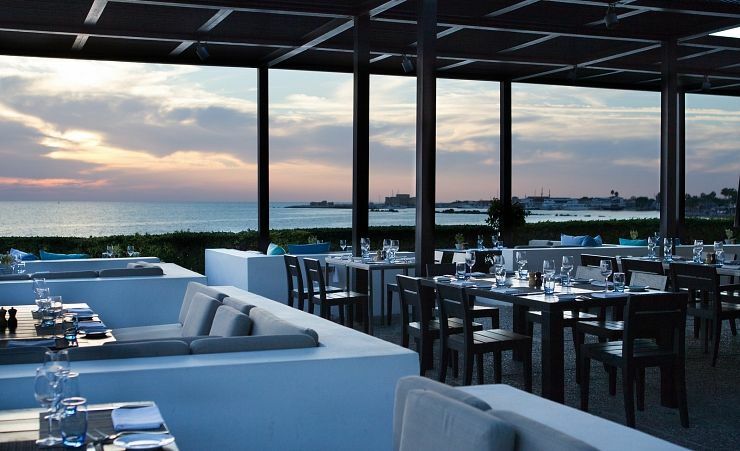 I wouldn't hesitate to go to either again with their wonderful sea front locations and views of Paphos castle. Cannot fault this hotel or the service. Impeccable. Excellent welcome and check in on arrival. All staff always so happy, smiling & helpful. The food and staff were excellent. We stated at the Annabelle hotel which is linked with the Almyra. Staff were excellent. Stayed here last year but had better room and food this year. Have always found Mercury Brochure easy to understand and you have a good range of holidays. Whole holiday experience from booking with agent right through to the returning home arrangements was excellent. Very many thanks for facilitating a wonderful holiday. The hotel staff very welcoming and attentive. An excellent holiday overall. The hotel was all that we hoped it would be. Excellent design features resulted in a welcoming environment. An excellent hotel and holiday.Our third Spring visit. just back from a short winter break at almyra hotel,paphos,cyprus.would not hesitate in recommending this hotel to anyone considering a stay there.superb location,excellent facilities,fabulous sunsets,friendliest staff i've come across for some time.all in all a most enjoyable stay. The hotel was fabulous and so much more than we had imagined from the pictures on the web. It was contemporary, modern and had a wonderful relaxing ambience. 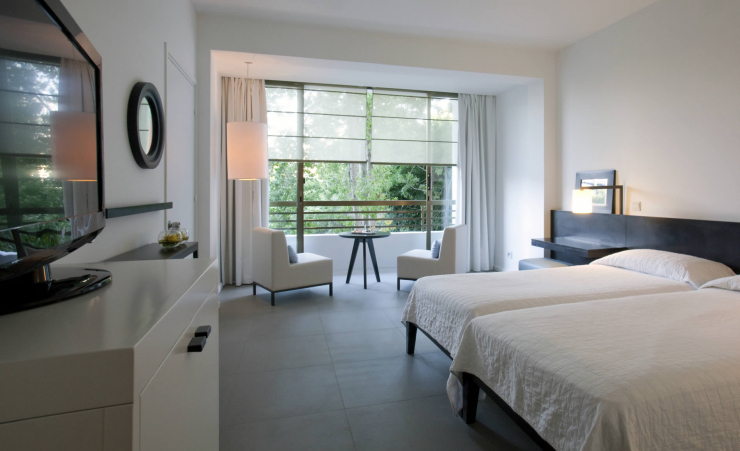 The room was outstanding in design and spotlessly clean with good quality toiletries. The food was mainly Meditteranean which was well presented, very fresh and catered for all tastes. The spa facilities were excellent and used by us every day. All the hotel staff were extremely helpful and very friendly. Very pleased with the Almyra. All staff were excellent. Entertainment was good but maybe required dedicated member of staff to get more participation from guests. The staff are very helpful and friendly and clearly very proud of what they do (and rightly). There was a bulb out in our room and it was replaced within an hour of being reported. Whenever we requested anything it was done immediately. This is probably the best hotel experience I have ever had. Keep it up! Holiday was so good that we booked with you for next Christmas, while we were still there. We are delighted with Mercurys service. Also being sent an email before we left telling us to enjoy our holiday, which was a nice touch. We have stayed at the Hotel 2 years ago and do recommend it to friends, would go again. Helpful,friendly staff(not pushy! ).Well located on prom.Variety in food(non-meat eater so important to me).Keen to go to the hotel again. Staff friendly and helpful but not pushy!Good location by the sea and close to town facilities.I would be keen to go there again.Variety in food good for me as non-meat eater with option to use neighbouring hotel the Annabelle also for meals. Top class hotel. Exceptional staff. Charming staff and very helpful in all respects. This was our second visit to this hotel .Last year it was great ,this year superb. The food is outstanding the hotel and amenities are clean and relaxing. CANNOT FAULT IT !!!! This is a lovely hotel with welcoming staff and good food. It is in a fantastic central location within easy walking distant of the harbour. Would go there again. This hotel really is all its cracked up to be. Modern, great facilities, ideal location, food excellent and varied, staff unfailingly helpful. Fab hotel, food excellent. We didn't get our dinner on the first night though as we arrived 10 mins after service had finished. The hotel and all that went with it made our holiday a success, the weather was generally awful so to be able to return to the hotel and relax and be very welcome was everything. 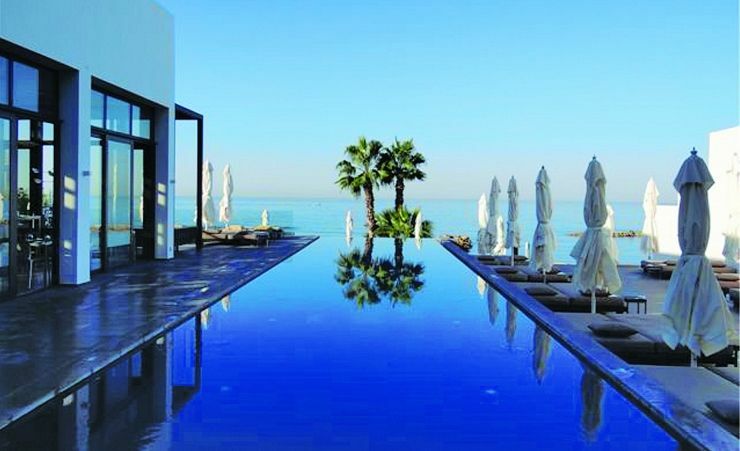 We were very happy with our choice of The Almyra Hotel in Paphos and hope to return next year. We we particularly impressed with the excellent staff everywhere in the hotel. Superb! Consistently good food and service. Staff very helpfull and courtious. Absolutely wonderful. The staff were terrific and so friendly and the food was outstanding. we loved every second of our stay, thank you very much. We stayed at this hotel last year and decided as we enjoyed it so much to revisit for longer holiday. Hotel was as good as first time of visit however the service in the Mosaic restaurant was nowhere as good as last years visit. However this would not deter us from revisiting. departments, they cannot do enough to help you if you have problems. They do take notice if you have a complaint and act immediately. From the manager down to all dfepartments----great. a very relaxed hotel.